Today's story starts in a building that a white couple bought to set up a store in a predominantly black neigborhood in Jackson, MS. While cleaning out the place, Mrs. Lillian McMurry finds a stack of records with artists she never heard of. Out of curiosity she gives them a spin on the phonograph and she gets to hear the most exciting music she ever heard. It won't be a surprise when I tell you that it was Rhythm & Blues that she first got to know - in the segregated Deep South is was pretty likely you never got to hear that as a middle-class white woman. She instantly loves the music and also finds out that the records sell well in the neighborhood and within a year after she first heard of the blues, she decides to start her own little company to produce records of the local legends, that have no place to go but to the cities far up North or out West to have themselves recorded. 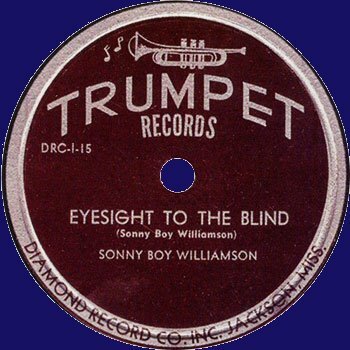 The Diamond Record Company and its label Trumpet becomes the home label of Sonny Boy Williamson the second, a raw man who stole the name of a bluesman from Chicago for reasons that sound like made-up legends, and whom Mrs. McMurry had tracked down all the way from Helena, AK where he'd become famous for his weekly stint on the local radio station. Also Trumpet recorded the iconic Dust My Broom of Elmore James, the result of what James thought was a rehearsal. With her label Lillian McMurry documented the music of some Southern bluesmen who hardly would have had any other chance to be recorded.